Coloring Easter eggs has always been one of my favorite Easter traditions, so I knew that I had to introduce you all to this beautiful rubber cement technique… I mean, how amazing are these eggs?!? Coloring Easter eggs with this process really could not be easier (kids can help! ), and the brilliant contrasting colors are absolutely stunning! When it comes to dyeing Easter eggs, I much prefer to make my own dyes using Betty Crocker Classic Gel Food Colors over the kits that you can purchase. The colors turn out super vibrant, and you can easily control the shades with a little creative mixing. *Be sure to buy the Classic colors gel food color set. I tried the Neon colors set, and the ingredients differ slightly, which led to some funky residue that stuck to the eggs. The first thing you’ll need to do is create an egg drying rack. If you’re using blown-out eggs, you can simply insert the pointed end of a skewer into the eggs and insert the blunt end into an egg carton turned upside down to create a stand. 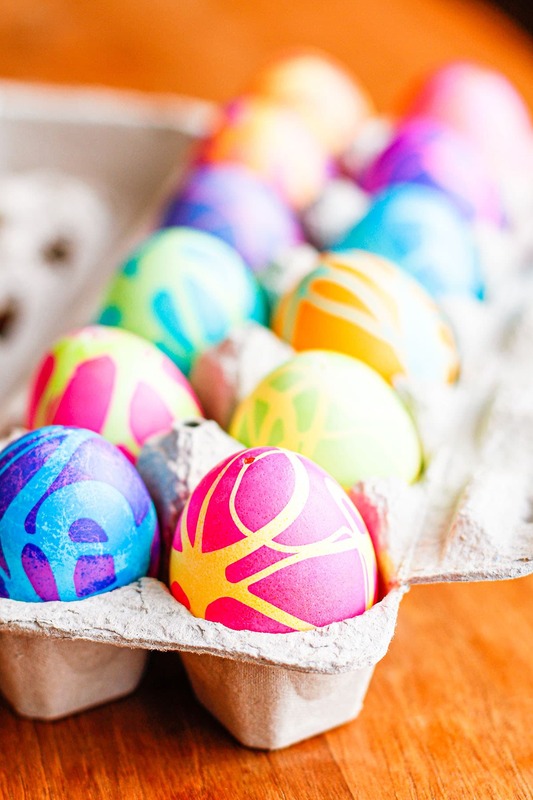 But if you’re coloring hard-boiled eggs, you’ll need to get a little creative. TIP: My favorite method for boiling eggs for Easter is these Instant Pot hard boiled eggs. But if you don’t own an electric pressure cooker, these baked hard boiled eggs run a very close second! I’ve seen a number of approaches that use foam and pins or nails to make stands, but this toilet paper tube rack I came up with is far less expensive and works just as well! Simply cut a toilet paper or paper towel tube in half lengthwise. Then cut strips horizontally and tape the ends together to create a smaller circle that’s the perfect size for an egg to sit on. Hopefully you get the gist from the image above, but if you have questions, just ask! 1| Mix your desired colors according to the directions and color blending chart on the back of the Betty Crocker Classic Gel Food Colors package. 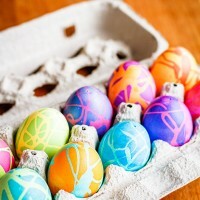 2| Start by dyeing your eggs a lighter base color. The actual color you select doesn’t matter so much as the length of time you leave the egg in the dye in this initial step. Check them frequently and remove while the intensity of color is still low. Drain off the dye and allow the egg to dry completely. 3| Once the eggs are dry, it’s time to apply the rubber cement. Holding an egg gently on either side, use the applicator brush to drizzle rubber cement over the egg in an abstract pattern. If you have blown-out eggs, you can do the drizzling step while they’re still on a skewer, but I got frustrated with them slipping off and still ended up using my fingers. After a couple, you’ll get the hang of drizzling while avoiding your fingers. Allow the rubber cement to dry thoroughly. 4| Now it’s time to dye the eggs a second color. Choose a color that’s going to have high contrast with the base color, and leave the eggs in the dye until the color is very intense. Once you’re satisfied with the color, drain off the dye and allow the egg to dry completely again. 5| It’s time for the magic to happen! When your egg is thoroughly dry, simply use your fingers to gently rub the rubber cement off the eggs, revealing the lighter base color. If you’ve used blown-out eggs, be very gentle in this step, especially near the holes on either end. I cracked a couple of my favorite patterns when I was a little overzealous in my removal. While I stuck with two dye colors for these images, you can get really creative with this method and pair three or more colors to create some pretty awesome effects. Just apply a little more rubber cement after each color application, and dye in successively darker colors. I’d have to say my favorite combinations are the super high contrast colors, like the purple/orange and pink/yellow eggs. But I also think the more tonal blue/green and purple/blue eggs are pretty spectacular, too. Get a little crazy and try different color combinations — if you’re not satisfied with the way one is turning out, just slip it into another color and dye over it until you’re satisfied. PIN IT NOW! 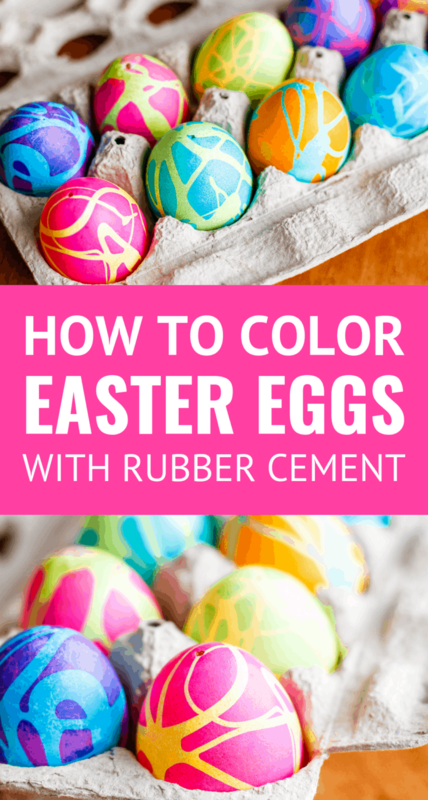 CLICK HERE TO ADD THIS HOW TO COLOR EASTER EGGS WITH RUBBER CEMENT TUTORIAL TO YOUR EASTER BOARD ON PINTEREST! Mix your desired colors according to the directions and color blending chart on the back of the Betty Crocker Classic Gel Food Colors package. Start by dyeing your eggs a lighter base color. The actual color you select doesn’t matter so much as the length of time you leave the egg in the dye in this initial step. Check them frequently and remove while the intensity of color is still low. Drain off the dye and allow the egg to dry completely. Once the eggs are dry, it’s time to apply the rubber cement. Holding an egg gently on either side, use the applicator brush to drizzle rubber cement over the egg in an abstract pattern. If you have blown-out eggs, you can do the drizzling step while they’re still on a skewer, but I got frustrated with them slipping off and still ended up using my fingers. After a couple, you’ll get the hang of drizzling while avoiding your fingers. Allow the rubber cement to dry thoroughly. Now it’s time to dye the eggs a second color. Choose a color that’s going to have high contrast with the base color, and leave the eggs in the dye until the color is very intense. Once you’re satisfied with the color, drain off the dye and allow the egg to dry completely again. ﻿It’s time for the magic to happen! When your egg is thoroughly dry, simply use your fingers to gently rub the rubber cement off the eggs, revealing the lighter base color. If you’ve used blown-out eggs, be very gentle in this step, especially near the holes on either end. I cracked a couple of my favorite patterns when I was a little overzealous in my removal. Note: Several readers have questioned whether the eggs are safe to eat after using this technique. I’m going to err on the side of caution and say no, I don’t recommend eating them. Rubber cement is not food safe, and eggshells are fairly porous — not a good combination. If you use this technique when you’re coloring Easter eggs, I’d love to see some pictures of your finished eggs… Please stop back and share in the comments below! Or you can tag me @Unsophisticook on Instagram or use the hashtag #Unsophisticook so I can check them out. Have fun! These are so bright and colorful! Love the designs that you can come up with too! These eggs are so cute!!!! I never knew you could use rubber cement…what a great idea! The coolest looking Easter eggs I’ve ever seen! This is so genius! I love how bright and fun they turned out! Could you use hot glue if you didn’t have rubber cement? Hi Alison! Sorry I missed your question over the weekend. I haven’t tried using hot glue, but my guess is it would probably be difficult to remove, especially if you’re using blown-out eggshells, which are very fragile. Did you happen to give it a try? How much vinegar/water do you use? Hi Julie! The dye instructions are on the back of the Betty Crocker Gel Food Colors packaging, but it’s 1/2 cup of hot water + 1 teaspoon of vinegar + 1 teaspoon of gel food color. Hope that helps! How long does it take for the first dye to dry and then for the rubber cement to dry? Or just the whole process for one egg, how long does it take? Hi, Sami — good question! I’d say one egg start to finish took about 25 minutes, but I had multiple batches of eight going at once. I had eight colors of dye prepared, so while one batch was drying, I was dyeing another batch. I think I let the first coat of dye dry around 5 minutes, and then I dabbed any damp areas with a paper towel. The rubber cement takes around 10 minutes to dry, and then after dyeing, I waited until they were completely dry before removing the rubber cement. Is it safe to consume the boiled egg after using the rubber cement method? Good question, Anna! We don’t usually eat the eggs that we color, but I should have anticipated that some readers might. I did some research on the method, and though I found that a lot of people who’ve used it do eat the eggs, I’m going to err on the side of caution and discourage readers from eating them. Rubber cement is not food safe and eggshells are fairly porous, so I’d say it’s not recommended. I’m going to add a note to the post with this info. Thanks! Most stores now carry fake dyeable eggs (SO much easier than hardboiling real ones) – so I think it’d probably be best to use this method on those. Oh, I’ve seen those at Walmart! I haven’t tried them, but I’d think they should work with this method. As I mentioned in the post, you can also use blown out eggs, which is another good option if you want to reuse them year after year. Rubber cement is fun to do. Try doing a third round – rubber cement over 2nd dye then dye with 3rd color. You wouldn’t want the second dye super dark for this. A similar idea is to use the clear wax crayon that some kits come with. Draw some lines or swirls, dye the egg, when dry draw some more lines or swirls. repeat 2-4 times. Start with lighter colors then end with darker. wax should be clear enough to see colors thru it. or melt off in the oven on your lowest setting for 5-10 min then carefully wipe with paper towel. caution not to burn yourself. Your eggs turned out really cool looking! I don’t think I’d use hard boiled eggs though to be safe. Eggs are porous and the cement has some pretty nasty chemicals in it that I wouldn’t want my family to ingest! Thanks, Lori! I agree, and I’m adding a note to the post with the info I’ve found on the topic. this is a really fun idea! I think my daughter will have such fun making these, thank you for posting this !! !